42) Frank Lovejoy-Frank Lovejoy enjoyed one great hit starring role in his career as reporter with a heart Randy Stone in Nightbeat. The program a fan favorite for its mixture of suspense, mystery, and true human drama. However, Lovejoy’s contributions go far beyond that. He began as an actor on programs such as Jungle Jim and The Columbia Workshop and was the first announcer on This is Your FBI. Lovejoy continued to provide solid dramatic support for the latter days of radio’s golden age, frequently lending his talents to Suspense from 1957-59. Throughout his career, Lovejoy did well through his ability to create believable characters whether it was a heavy on Box 13, a cop after typical mugs in an episode of The Damon Runyan Theater, or one of Luigi Bosco’s typical comic foils in Life with Luigi. While Lovejoy never had a huge success with his television programs, he remains a beloved figure in the annals of radio. 41) Getrude Berg-Gertrude Berg was one of those radio pioneers who created a lasting legacy. Her program The Goldbergs began in 1929 and would run over radio and television until 1956. The program was a comedy soap telling the real life struggles and trevails of a Jewish family living in a poor Brooklyn neighborhood. The program became beloved by millions and with its humor and heart brought a slice of life that many Americans simply didn’t know existed. Throughout the shows 27-year run, Berg remained the friendly and unchanging faces of one of the golden age’s most successful enterprises. 40) Gerald Mohr-Mohr’s career bears some striking similarities to Lovejoy’s and perhaps to Moyle’s as well with a great starring role and a lot of character work. 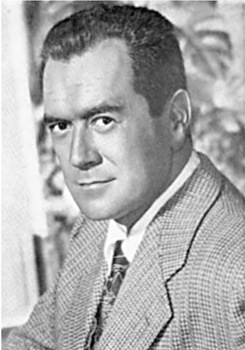 Mohr’s most memorable lead role was as radio’s Philip Marlowe. Arguably, Mohr’s version of Marlowe is definitive both in terms of quality and quantity of performances. His opening line from Philip Marlowe, “Get this, and get it straight: Crime is a sucker’s road and those who travel it wind up in the gutter, the prison or the grave. There’s no other end … but they never learn!” was among the best openings to any radio show and Mohr’s delivery made it happen in a way that few other actors could manage. In addition to that Mohr was a frequent cast member on The Whistler making an astonishing number of appearances. When we were doing the program Rogue’s Gallery on the podcast, I was astonished at how many times, Mohr played the murderer. Most weeks, Gerald Mohr character did it. In addition to this Mohr played a murderer on The New Adventures of Nero Wolfe one week and then returned as perhaps the best Archie Goodwin on the series the next week. Of course, his radio career was not all mayhem and mystery. He also played a recurring character as a charming French teacher on Our Miss Brooks. When producers availed themselves of Mohr’s services, they would be guaranteed to use him and often-a mark of his true talent.